john4jack (Corvallis, Oregon, United States) on 6 November 2011 in Architecture and Portfolio. The mystery deepens with the black and white tones. Such a wonderful bridge. En nb aussi beau qu'en couleur, sueprbe très bien vu de nous présenter sous les deux façons. I have a feeling I will still prefer the color but you never know. Great shot. In colors, in colors !!! superbe ce traitement noir et blanc ! Looks great in black and white too. Well done! 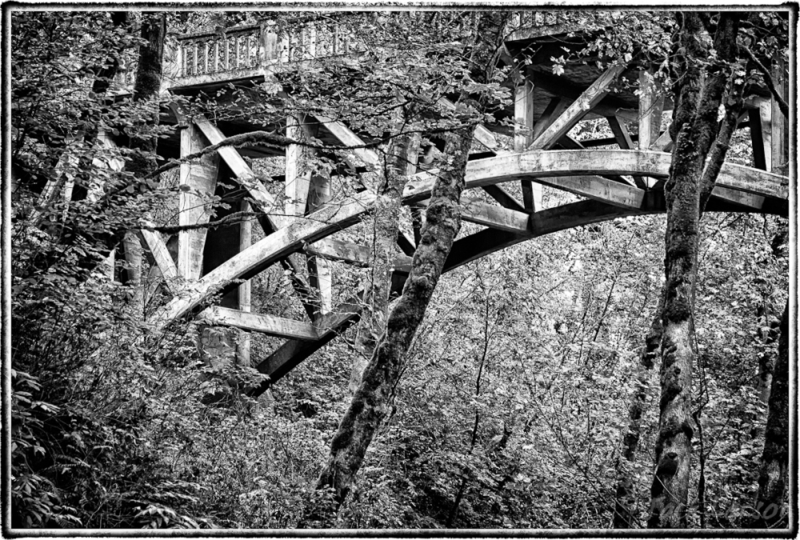 i like this striking monochrome version for its emphasis on the contrasting arching lines of the bridge with the vertical lines of the tree trunks. Wonderful! mir gefällt dieses SW sehr gut, feine Tonwerte. This is attractive in B&W, but I think yesterday's color shot had more impace. Equally impressive in b/w, Jack. buen b/n, me gusta mas el de color! extraordinary processing and perfekt choice for bw! Beautiful capture in black and white. I like both ways! This gives off a slightly different mood, but I like them both!